Children and teenagers who were drawn into Ivory Coast’s 2010-2011 post-election conflict are joining armed gangs in the commercial capital Abidjan after being abandoned by politicians and others who exploited them at the time, according to local officials who blame the government for not taking action. Aged 10-20, the youngsters roam Abidjan districts, robbing residents and stall-owners using firearms and other weapons, and in some cases killing those who try to resist. The gang refer to themselves as “microbes” – slang for “cold-blood murder”. 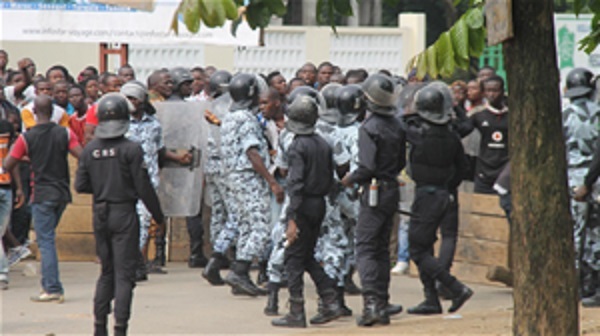 Four gang members were killed in mid-July in a clash with security forces in Abidjan’s Attécoubé District. It was the first time the security forces had taken on the “microbes”. “Since the conflict ended, we have remained at our ‘bases’ in Abobo, Adjamé, Attécoubé, Williamsville. None of our older brothers have come to help us, yet we fought together during the post-election crisis,” said 16-year-old Daouda Konaté* in Attécoubé in central Abidjan. Some of the older youths and young men who fought in the streets during the post-poll violence have been absorbed into the regular army. Ivory Coast plunged into months of fighting (pitting supporters of then opposition leader Alassane Ouattara and Gbagbo loyalists) after incumbent Gbagbo refused to acknowledge defeat in the November 2010 presidential run-off. “We are from poor families and this is the only activity that ensures our survival. We attack people for money to buy food, nothing more. Personally I don’t know the motives of those who are armed,” Konaté said. These children were left out of the country’s post-conflict reintegration of former fighters despite having been involved in the fighting, said a senior human rights official, blaming the authorities for doing nothing as the “microbes” infested Abidjan’s four most populous districts. The government of President Ouattara has made some progress in addressing the impact of Ivory Coast’s brief civil conflict. It set up commissions to foster reconciliation, disarm fighters and investigate crimes over the election violence. However, critics say the impact of those efforts has not been far-reaching. The human rights official observed that there seems to be a lack of attention to the threat of the “microbes” and cautioned that in the next 3-4 years the gang could become a “huge armed group” if not curbed now. “Since the gang emerged, we have repeatedly urged the government to take responsibility. But given the rising incidents, the overarching impression is that this new form of insecurity is symptomatic of failure of the authorities,” said Diakité Tawakkal, who heads local NGO Youth Without Borders. Meanwhile, head of the Operational Decisions Coordination Centre, a special military unit tasked with fighting banditry, said families of the “microbes” gang-members bore initial responsibility for taming the youngsters’ waywardness. “Our men have battle weapons and are faced with children armed with basic weapons. We are looking for the best way out, but we think that the children’s parents should be sensitized first,” Yousouf Kouyaté told reporters. Anne Ouloto, Ivoirian minister for solidarity, family and children, said the whole society was to blame, and that the allure of gang life was as a result of broken families, an argument deemed facile by Ismaël Fofana, a father of four who lives in Williamsville. “It’s easy to say parents have the main responsibility, but it is incomprehensible that the government is asking religious leaders to tackle a problem partly caused by politicians,” Fofana argued. The “microbes” have spread fear among residents, with stall-owners now closing early and opening late to evade attacks that have spawned vigilantes in certain districts, but the self-defence groups have yet to be effective, said restaurateur Aminata Kamara. “These youths are in every intersection in the neighbourhood. We are deeply afraid at night because they can break into the houses at any time,” said Abobo resident Florent Kouamé.